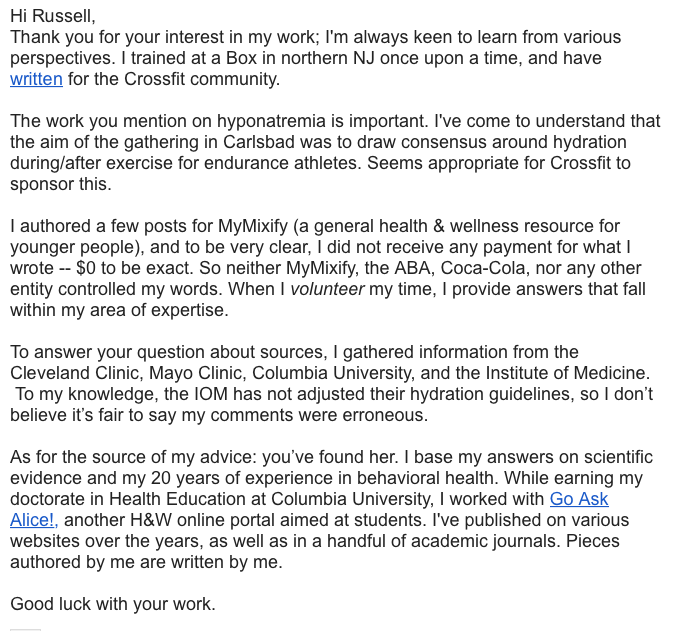 Stephanie Habif’s Mixify Hydration Advice: Willful Negligence? In September, I became aware of a website called Mixify. The site is a production of Coca-Cola, PepsiCo, Dr. Pepper Snapple Group, and their mutual advocate the American Beverage Association, and it aims to help youth “balance what you eat, drink and do.” The site is a well-crafted attempt to make Big Soda appear morally responsible despite a growing mountain of evidence that soda is a major contributor to disease. Mixify teaches children to attain energy balance, which means matching calories expended to calories consumed. This balancing act is based on the belief that total caloric intake (rather than macronutrient ratio or type) is the primary concern in preventing disease. 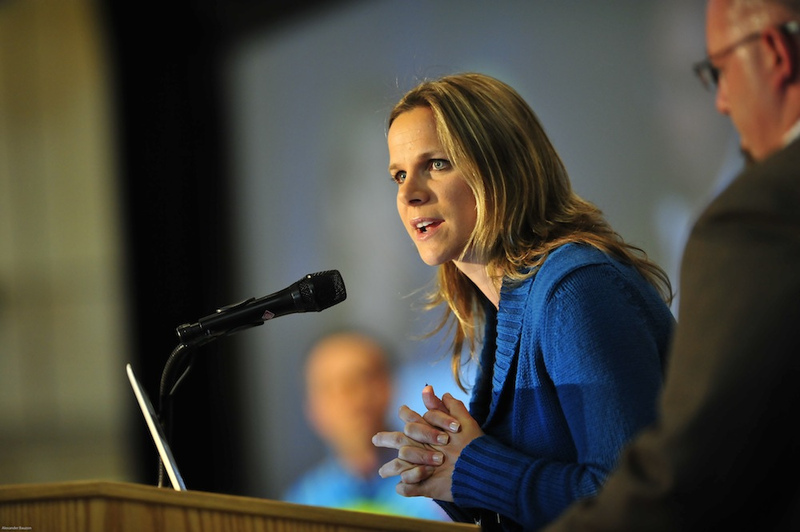 Coca-Cola has championed this belief through its funding—in partnership with the American College of Sports Medicine (ACSM)—of the Global Energy Balance Network. Energy-balance theory not only contradicts data published by UCSF pediatric endocrinologist Dr. Robert Lustig, but it is also based only on conjecture (See Lon Kilgore’s article on this subject). Children taught to follow an energy-balance system based on conjecture will conclude that sugar is not inherently toxic (contrary to abundant evidence), and that the harmful effects of drinking a can of soda per day can be offset by playing a game with a Frisbee. Beyond simply confusing kids about the cause of diabetes, Big Soda’s harmful effects extend further. As soda sales decline, sales of bottled water have been steadily rising. Coke and Pepsi alone share about one-fifth of the bottled-water market. So what could be better than using Mixify to recklessly encourage water consumption? At the time of this writing, it has been two weeks since I sent this final email. Habif has refused to answer any further emails or text messages. 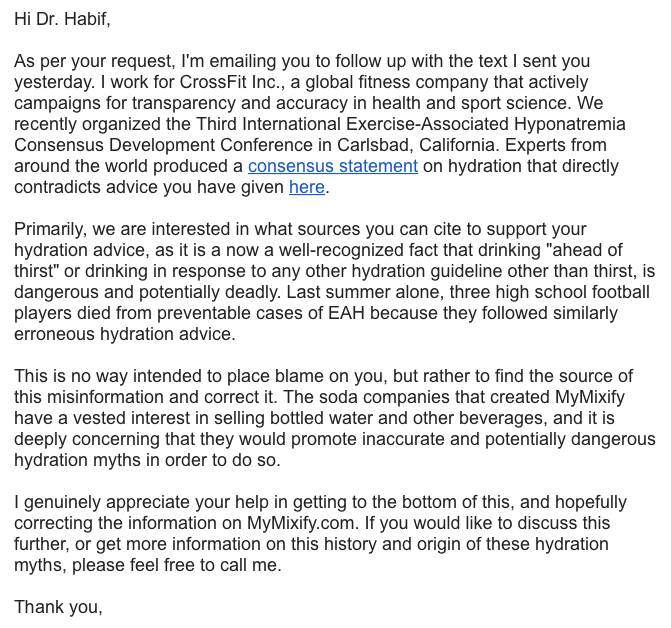 I do not believe Habif knew that her views of hydration were dangerous, misguided and now outdated. An intellectually honest academic should be able to accept constructive criticism of her work based on more reliable information and update it accordingly. 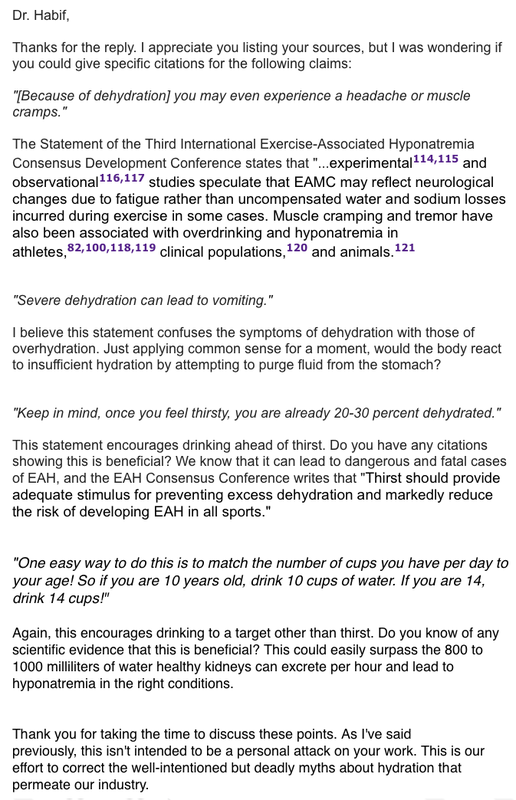 Rather, Habif seems to have chosen to ignore my concerns about her advice, which directly contradicts the Statement of the Third International Exercise-Associated Hyponatremia Consensus Development Conference. To mistakenly publish dangerous advice is forgivable. To mistakenly publish dangerous advice, learn of the danger, and do nothing is unconscionable. In 2014, two high-school football players died from EAH, both under the impression that aggressive hydration was critical to avoid heat injury and injurious levels of dehydration. Should another death occur, and should it be found that the victim viewed Habif’s article, I hope we hold her both legally and morally accountable.